I shall let you into a little secret - I've wanted a Furby ever since I first knew about their existence. I am certain that I was the most excited person in my family when we found out that a new Furby Connect was going to be coming to live with us. The Furby Connect from Hasbro is billed as one of this year's must-have Christmas toys, an interactive pet with their own virtual world. Our Furby Connect has been a fun addition to the family but I'm not sure I'd describe it as a must-have. Furby is an interactive fluffy pet with all sorts of different phrases, movements and expressions that really encourage interactive play. I think of our Furby as another pet in our family and quite often find myself chatting to it while I'm busy doing a job and reaching over to stroke it as I would the cat! We looooove the fluff. Who can resist the brightly coloured fur? Furby is funny. Lara particularly enjoys looking out for all the different faces that Furby makes with his animated LED eyes which are really expressive. Holly is most won over by the sneaky fart noises that he makes when you pull his tale. Fart humour - you can't beat it. Lots of Furby's phrases are funny but some of the sayings don't mean a lot to Lara and Holly. I can't help but think that some of the humour may be lost on small people (but they do make grown ups snigger). I'm actually quite impressed with the number of phrases and the number of different movements that Furby makes. You can throw him, pat him, tickle him and he'll respond in different ways. When he wakes he talks you through his dreams and there are lots of different ways you can chat and sing with him. Furby's language is fun to try and interpret - its closely modelled on patterns of English but with made-up Furbish words that feel familiar and make you giggle. You can send Furby to sleep. Now, from what I've heard from owners of older Furby models, this is life-changing! Using the supplied sleep mask you can effectively turn Furby off by sending him to sleep so that you aren't woken up by him. Furby knows the date and time. During night hours he tends to be hard to convince to do more than say hello (Furby, very much like our cat, likes to mostly eat and sleep). Furby knows when it is Christmas and Easter and will respond accordingly. Furby is a surprisingly good singer and whistler! We've tried getting him to sing with us when Strictly is on! Press his light-up antennae and he will become all musical! On the whole, we've found the Furby Connect to be good fun but there are a few things that mean I don't think it is worth the price tag of around £99.99 (though you can find them from £59.99 on Amazon). 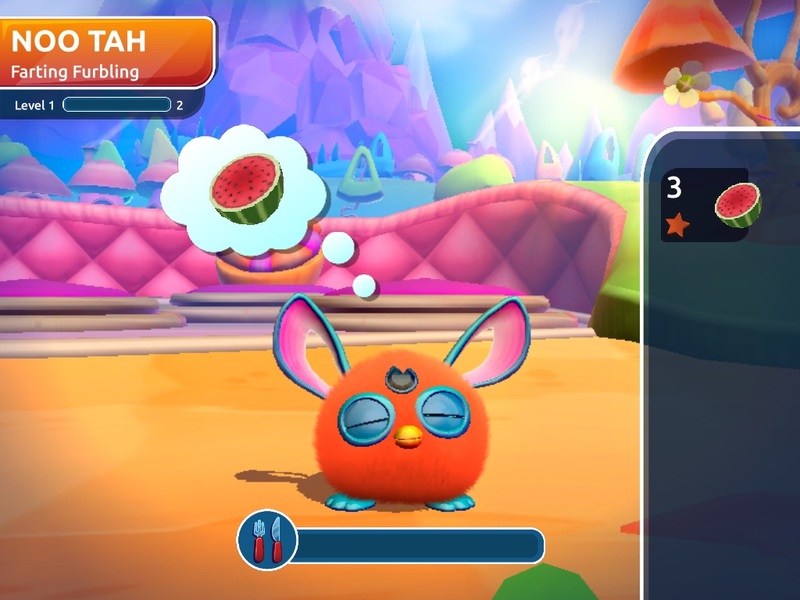 One of the unique selling points of the Furby Connect is the fact that you can unlock loads more functionality and personalisation using the Furby Connect World app which is available in the iTunes store and Google Play. This sounds fantastic but actually we were largely disappointed. Firstly, the app works with Furby through bluetooth and apple have had Bluetooth problems since iOS 9 (not a Furby problem, a known iOS problem that prevents lots of things working over Bluetooth on iOS) - for this reason we were unable to synchronise our Furby with the app and so we've only been able to use the app in the standalone mode. The game is playable without a Furby. The app is quite big (around 250MB); I had to remove several apps from the iPad to find space for it. The app also takes quite a while to load up; longer than Holly (4yo) is prepared to wait, and so she always closes it before it has even completed loading. Lara and I both have more patience but honestly, Lara's interest in the app lasted no more than 2 minutes; I don't think we had even really finished the set up at this point. I persevered, navigated around a bit and started our Furby viewing content in the virtual cinema (this is where your connected Furby can learn new songs to sing). I know Lara and Holly are missing out on some rich content for their Furby Connect such as hatching Furbling babies, feeding your Furby different foods, or finding out what happens when they go to the toilet!! I can't quite put my finger on why Lara and Holly are so disinterested in the app but I am sure it has a lot to do with the fact that we haven't managed to connect it to the real Furby. I'd like to see a web-based version of the game so that you can use it even if you haven't got access to a tablet or smart phone. In terms of playability, I'm still struggling with the Furby Connect. I quite like having him there in the room pootling on about nothing much but Lara and Holly lost interest within a couple of days. I've racked my brains to try and work out what would need to be different in order to keep them engaged and I'm sure that it is the gamification; there's no goal to aim for, no need to return to Furby other than for company. He;s too big to take with you when you go out, but not big or shapely enough to be part of their pretend play (I can't picture Furby being invited into the Barbie house, or the dollies pram). Unless I can get the app to connect via Bluetooth, I'm almost certain that Furby will stay with us, sitting on the dressing table being woken up about once a week for a few minutes of play before being abruptly sent back to sleep again. And poor old Furby...every time he wakes up he is ravenously hungry and yet it isn't entirely clear how you satisfy him. You place your finger in its mouth and he slurps enthusiastically but then keeps on complaining about being hungry. Maybe the app helps here? Furby Connect is available in Pink, Blue, Purple and Teal. Its eyes are animated and its ears and body move as it interacts with you. If you have more than one, they even interact with each other. Don't get me wrong, Furby is fun, but it hasn't quite hit the mark with us.